As its name suggests, the Norwich Terrier originated from Norfolk in the east of England, although it’s not clear when exactly. Records indicate that working dogs like the Norwich first appeared in the late 1800s when they were used for vermin catching and bolting foxes on the hunt. Their confidence and tenacious temperaments earned them a fierce reputation and they continued to be bred for their original purpose, with influences from the red Cairn, Glen of Imaal and Dandie Dinmont terriers in their early development. The Norwich, with its compact proportions and rustic appearance that blended well with the landscape, was a capable ratter that quickly became a favourite amongst the Norfolk gypsies. The Norwich helped to keep their living quarters free of vermin and protected barns and food stores from sabotage. Later, it was also utilised on the hunt, helping to bolt foxes for capture. The earliest breed examples varied enormously in size, colour and type, with some boasting drop-ears and others upright ones. The original Norwich Terrier standard encompassed both examples, although, in time, these two varieties became separate and distinct from one another. The prick-eared examples retained the name ‘Norwich,’ while the drop-eared became the ‘Norfolk.’ Today, the Kennel Club observes separate standards for both types, although there is little discerning difference between them. In fact, back in the 1800s, any small, rugged working terrier or farm dog was called a ‘Norwich’ whether it was or not. With the advent of selective breeding, the Norwich underwent many name changes depending on who was developing it and where it was being bred, including the Cantab Terrier after the Cambridge University students who kept it in their rooms, the Trumpington after Trumpington Street where it was supposedly first seen and the Jones Terrier, after Frank Jones who imported the Norwich to America before the First World War. At the time, Cambridge was home to plenty of unwanted vermin, in and around the riverbanks and fenlands, as well as in the streets and student housing areas. To try and control the population of rats, Norwich Terriers were brought in to help sniff them out. Trumpington Street was one of the worst affected areas in the district and home to a large number of Cambridge University students; hence, ‘Trumpington Terriers’ became the breed’s new name. However, this wasn’t to stick. Frank Jones was a renowned horse rider and dealer who, in the mid-1800s, set about developing the breed from his livery stable before exporting a handful to the USA. 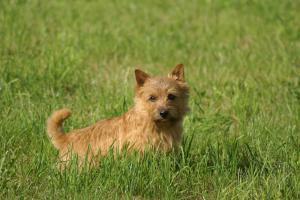 To develop the Norwich Terrier, Jones bred his Glen of Imaal Terrier and red brindle Cairn and then crossed the offspring with working terriers from local areas. Despite holding the name ‘Jones Terrier’ for a while, it was he who gave the name ‘Norwich’ when questioned about the breed on their arrival in America. In 1977 the Norwich Terrier was recognised by the Canadian Kennel Club and then, following suit two years later, the American Kennel Club put the two varieties – Norwich and Norfolk – on its books. Today the Norwich and Norfolk terriers remain popular, with in excess of 700 being registered last year.